Louisville City FC took a 6-4 victory against the New York Red Bulls II at MSU Soccer Park on Friday night as Cameron Lancaster had a hat trick. 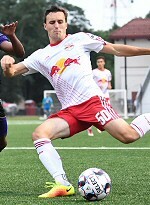 The Red Bulls II opened the scoring in just the seventh minute as Tom Barlow in behind the Louisville defense and centered for Andrew Tinari for a first-time finish. Five minutes later, New York's Ethan Kutler hit the outside of the left post with a free kick that was pegged for the top-left corner from 20 yards. The right-sided player doubled the Red Bulls II's lead with a low shot to the left corner. Louisville hit back in the 18th minute as Ilija Ilic finished off a near-post flick by Lancaster on a cross from the left with a bicycle-kick finish. Lancaster struck just before halftime, to level the game as he squeezed home a finish under pressure into the right corner. The visitors took the lead in the 48th minute as George Davis scored with a low shot from the right side of the penalty area. Louisville made it a two-goal lead five minutes later as Ilic clipped home Oscar Jimenez's free kick at close range. Lancaster's second of the night gave the visitors their fifth as he headed home after Paolo DelPiccolo had headed Jimenez's corner kick back across the penalty area. New York pulled back a goal in the 80th minute when Jose Anguinaga put home a low shot after the ball had pinballed around the penalty area, only for Lancaster to complete his hat trick with two minutes to go to restore the visitor's three-goal lead. The Red Bulls II replied once more in stoppage time as Hassan Ndam scored from the penalty spot, but that would be all as Louisville claimed all three points.